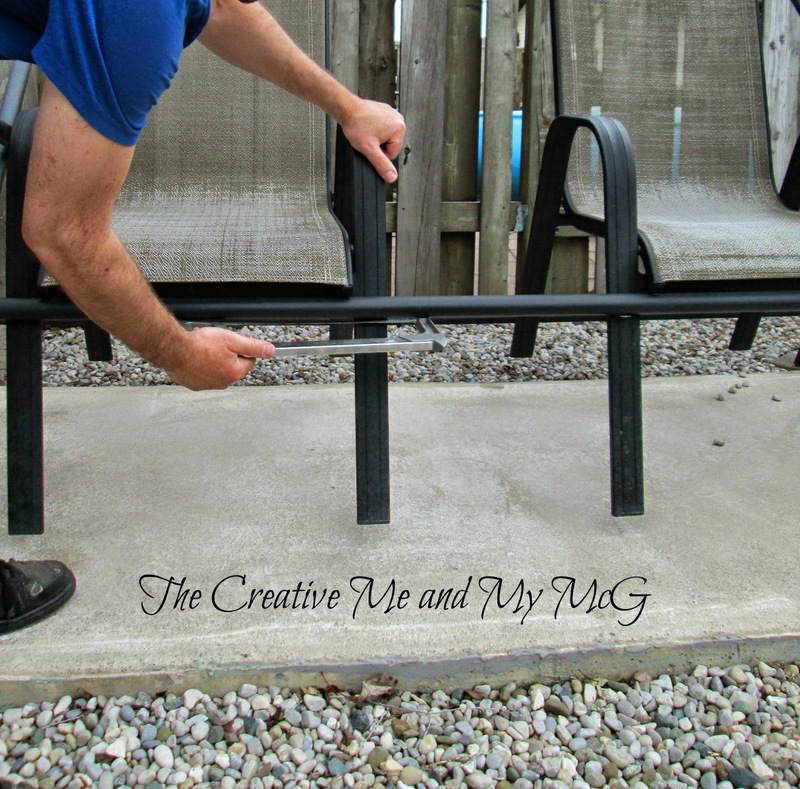 Join Me and My "McGyver" as we adventure our way through home decorating and DIY! Hello! I hope everyone had a great Easter Weekend! We had McG's family here for dinner yesterday. The weather was great and there was lots of good company, good food, and good fun! I feel like it's been way too long since I've shared a project with you. That's basically because there really hasn't been too much going on around here. 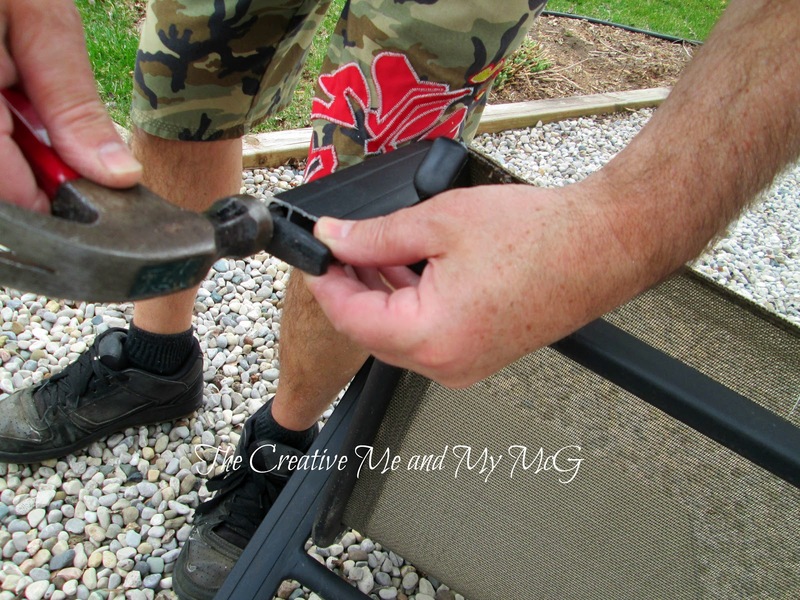 In anticipation of the good weather this weekend, McG and I took out the patio furniture. Having 30+ people for dinner makes things a little "tight" around here and we were glad that we would be able to have some extra room to breathe by utilizing our patio space. 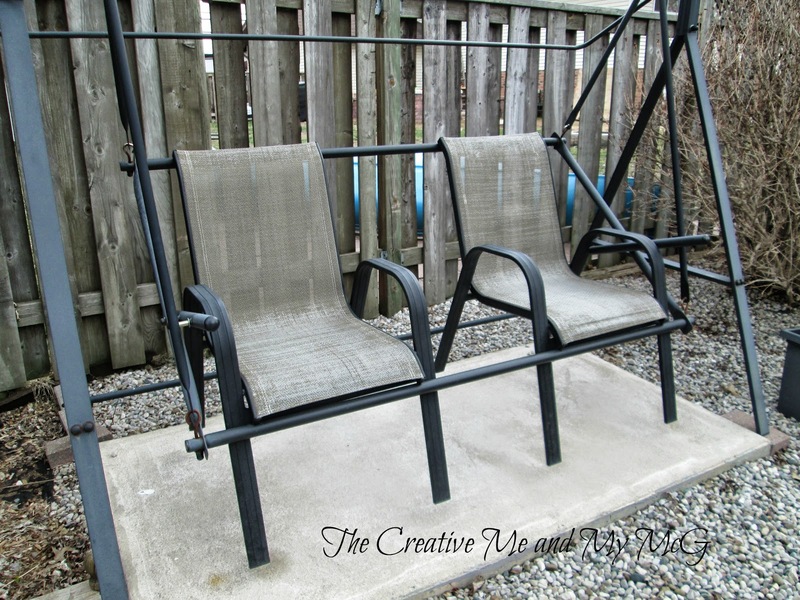 You may remember our garden swing makeover from last year. 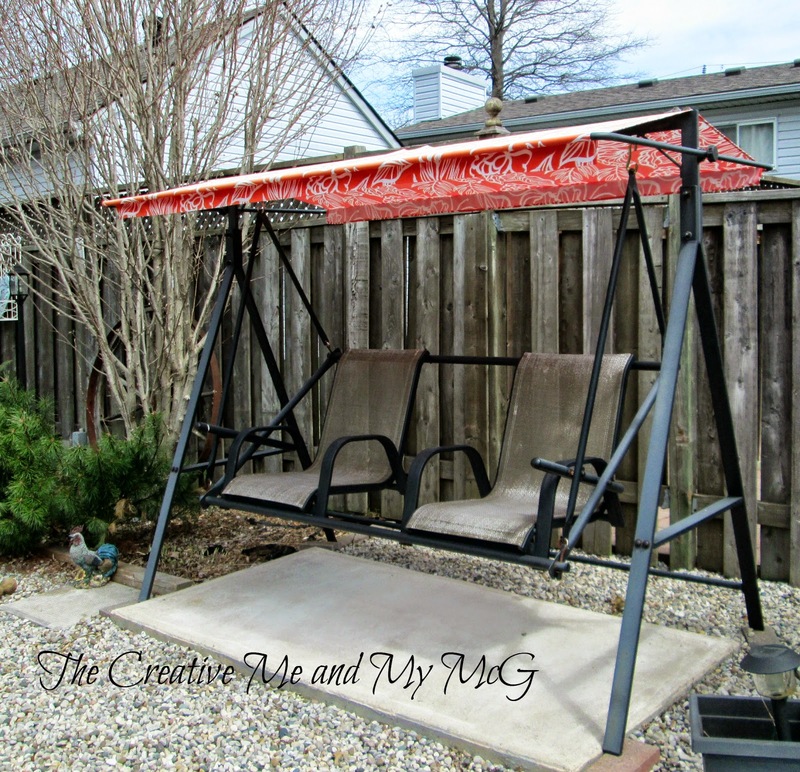 We basically took an outdoor tablecloth and remade the top to our swing. You can check it our here. 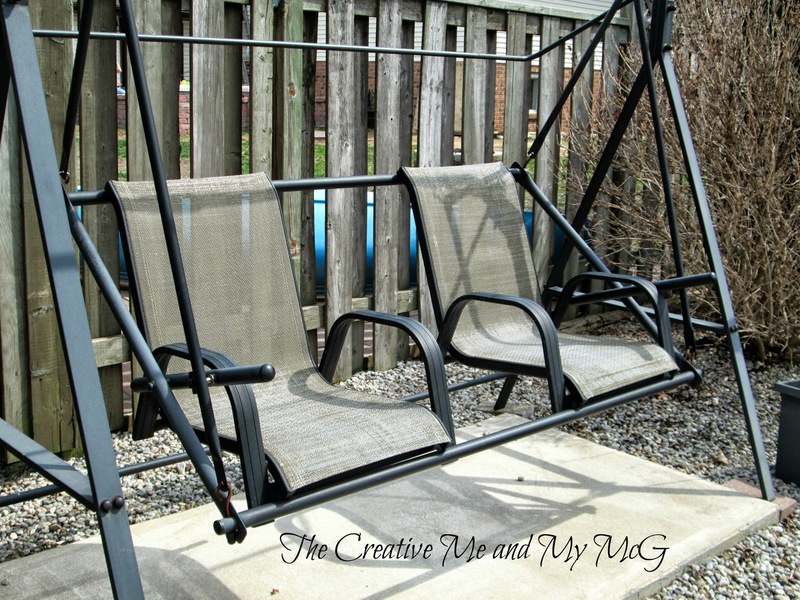 We have had this swing for about five years now and those cushions you see in the above photo were basically wrecked. They were mildewy from getting wet in the rain many times. When we took them out this year, I knew I didn't want to put them back on. But I didn't want to just throw the frame away either. We picked four chairs out of our neighbour's garbage last fall. 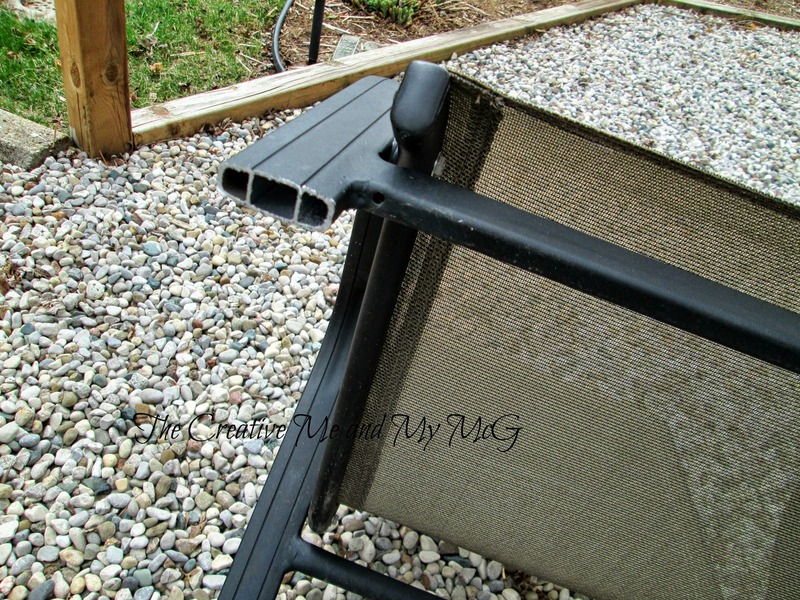 They were black aluminium with the nylon netting material, much like our other swing. That's our other swing in the background of this picture, along with the chairs in the front. ..."Hey too bad we can't use these chairs on there as a swing seat." Well, if you know McG, he takes things like that as a challenge! Off he went to the garage and he came back with a bunch of tools. He was ready to prove to me that maybe that was a GREAT idea - and that he COULD in fact make them into a seat for the swing. First up he used the hacksaw to mark where the legs needed to be cut off. Then he looked at me and said "Are you sure about this?" I said YES and if it doesn't work we are not really out anything since we picked the chairs out of the garbage! Once he cut the legs off he was worried that bees or hornets would go up inside and make nests in the legs. So, he pried the plastic feet off the bottom of the chair legs and put them back on the cuts so that couldn't happen. Then I placed them inside the swing frame. So far they were looking pretty good. 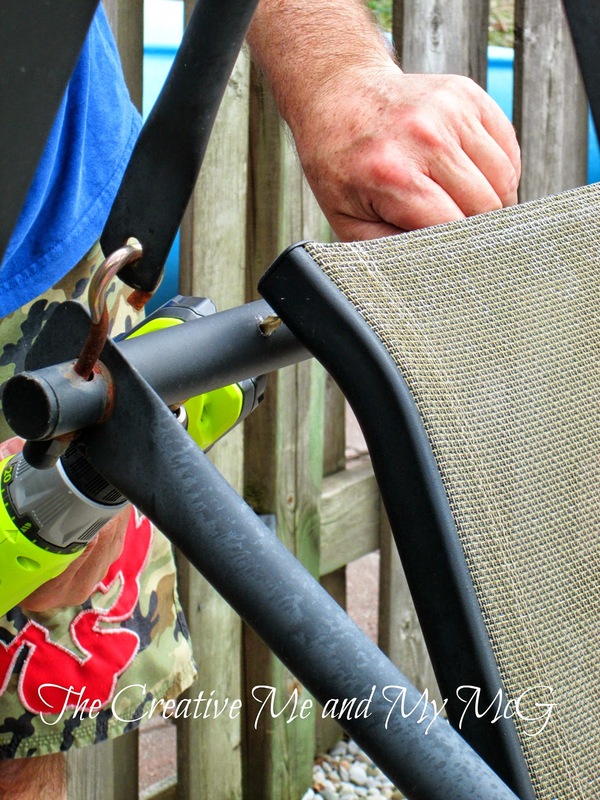 He used his drill to pre-drill the holes in the swing frame and the chair frame. He then secured them with washers and screws. Once that was finished and they were secured, all we needed to do was to put on the cloth top that we made last year. Now we have two new seats that won't stay wet after it rains. It turned out great and gives us another spot to sit in the garden. I LOVE that McG can never say NO to a challenge!! 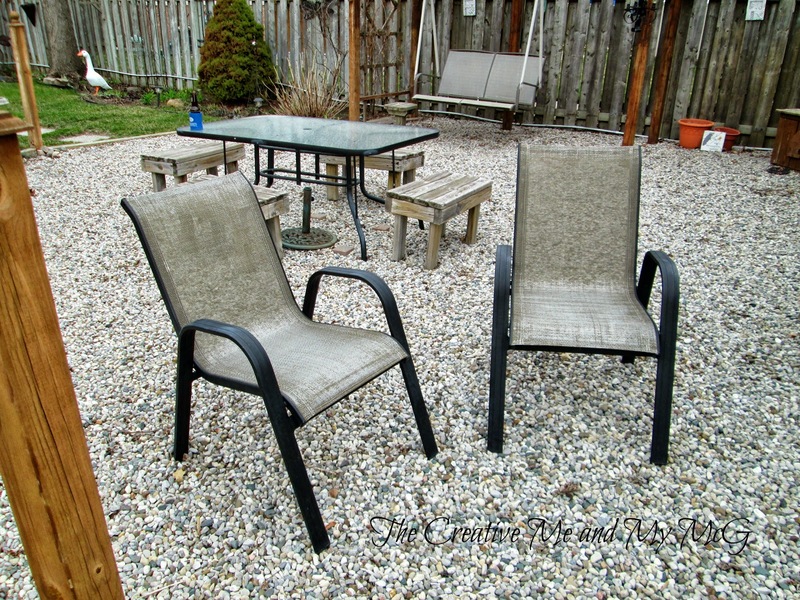 Have you got your patio furniture out yet?? that is truly amazing! even better that you got those chairs for free, so why the heck not! I love his forethought about the bees....yuck. now, not to make things more difficult for him...but can't you just see a little table of some sort in between the two chairs? or like a flat something or other to rest drinks on?? we haven't got our cushions or anything out yet...it needs to show me it's consistently spring before that happens here in PA, lol. also, good luck with your couch debrowning! I've tried for years, and think I have finally successfully done so. super appreciate (and laughed at) your comment on that. 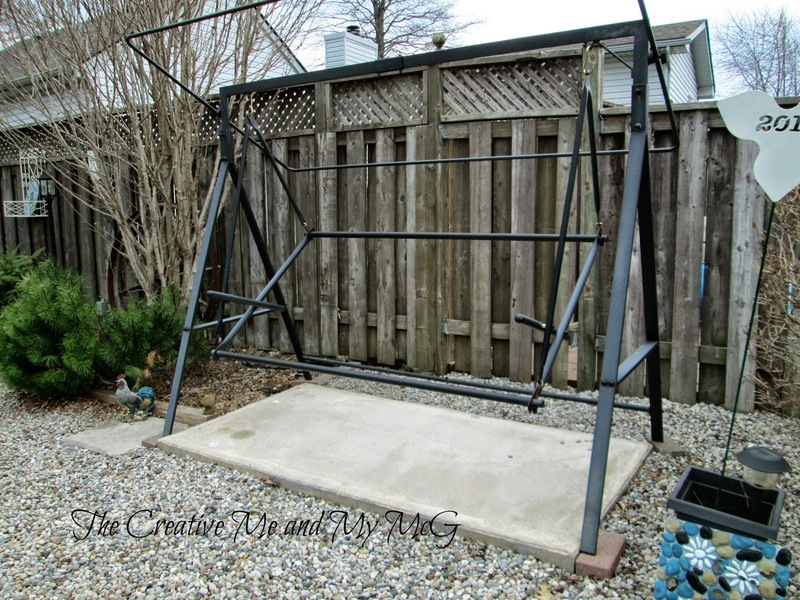 We did toss around using the leg portions that we cut off to make some sort of table, however, we feel that when it swings, anything you put on top would just slide off anyway. We are going to make some sort of drink holders to attach to the inside arm of each chair. Thanks Marty - glad you liked them! I love that you used an outdoor tablecloth for the top, that's awesome and so are those chairs! Wow, this is such an inventive transformation! Thanks for sharing at The Makers! How brilliant are you! Love that idea. 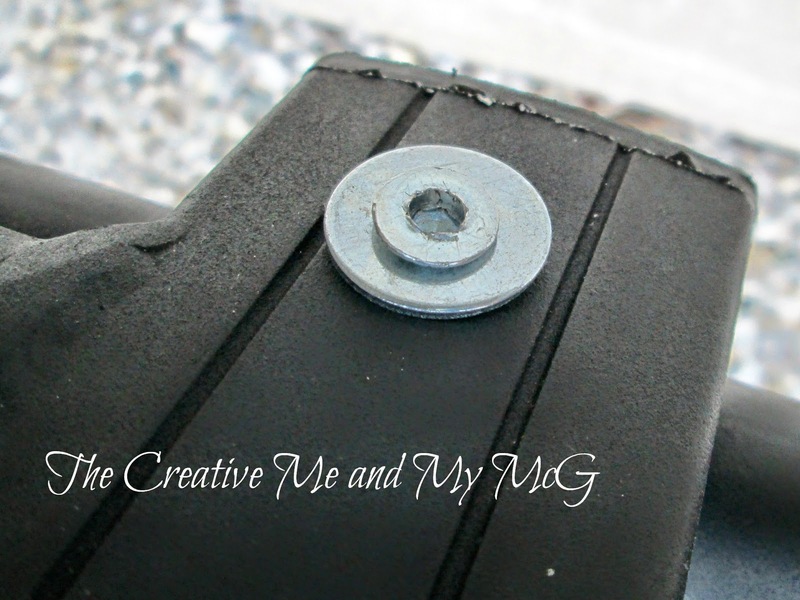 I'm featuring it in this week's Friday Features from our Inspire Me Monday party. Thanks for linking up and inspiring us! 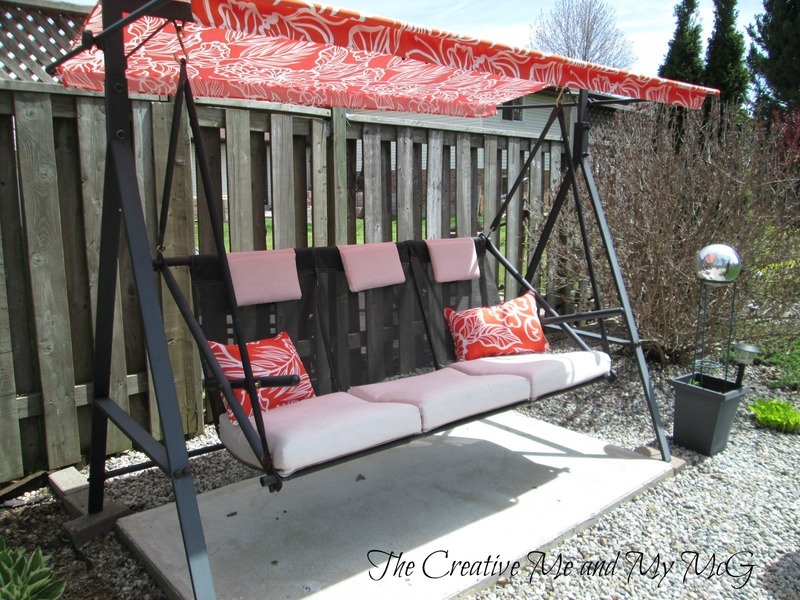 This is such a fantastic idea - I love how the swing looks!! very creative thinking! I love my McG too! What a great idea & it turned out soooo good. I love it!!! So creative, makes me wish I had my own McG!!! WOW......that is amazing. Never would have thought of that. Great job. Thanks for taking the time to visit my blog...please feel free to leave a comment or ask questions...and if you like this post - PLEASE SHARE!! !